The British prime minister is bowing to mounting pressure from lawmakers. 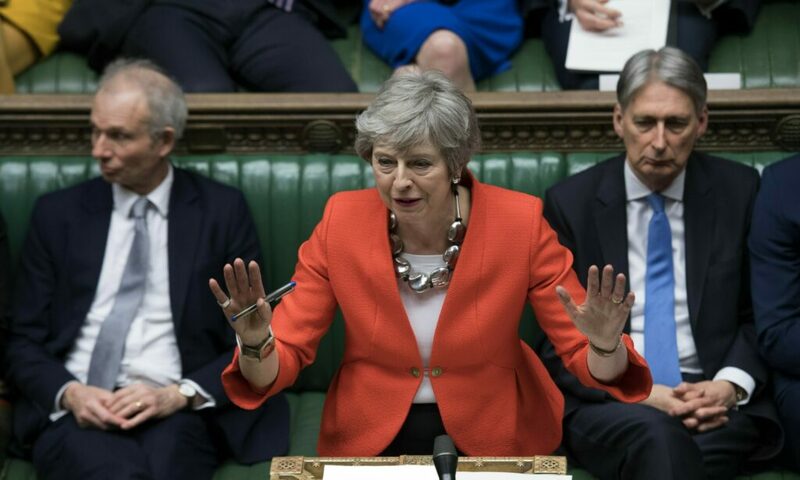 LONDON — British Prime Minister Theresa May told her Conservative Party lawmakers Wednesday that she would step down before the next phase of Brexit negotiations, offering up her leadership post to convince hard-liners to pass her unpopular plan to exit the European Union. “I have heard very clearly the mood of the parliamentary party. I know there is a desire for a new approach, and new leadership, in the second phase of the Brexit negotiations, and I won’t stand in the way of that,” she told Conservative lawmakers, according to excerpts released by Downing Street. Critics were quick to note that May didn’t offer a specific exit date. The prime minister’s announcement is seen as key to getting dozens of hard Brexiter lawmakers, including Boris Johnson and Jacob Rees-Mogg, to back her Brexit deal. After May’s earlier promise of a tentative, slow-motion resignation, the Parliament was set to vote Wednesday night on what kind of Brexit the fractious, quarreling, paralyzed lawmakers want. Even with May’s bold move, it is possible their answer will be a mush. It is also possible that a way forward might emerge in a series of “indicative” votes for or against a “soft” or “hard” exit from the European Union. The Parliament may signal whether lawmakers want a political and trade relationship with Europe like Norway has — or whether Britain should go it alone. Lawmakers could also push for a second referendum to give voters another say on how, or whether, they want to leave the E.U. Traditionally, the British Parliament has a brake but not a steering wheel. This week, though, lawmakers have seized control — for a couple days — of Britain’s exit process. The votes that begin Wednesday will be nonbinding. May has said she is willing to hear what the lawmakers have to say, while at the same time she worries the votes will stoke a constitutional crisis. May’s government opposed the voting scheme but is too weak to stop it. The House of Commons has in the past three months said what it does not want. Lawmakers two times voted overwhelmingly against May’s Brexit deal. They also said they do not want Britain to leave the continental trading bloc without a deal. Speaker John Bercow chose eight of 16 proposals submitted to proceed to a debate and a vote. Among the actual proposals brought forward is a Norway-style relationship with the E.U. That would allow frictionless, tariff-free trade, but it might make Britain accept the free flow of European migrants — a major objection among those who voted to leave the E.U. The opposition Labour Party, meanwhile, is pushing an “alternative customs union” Brexit plan. Other options include leaving the E.U. without a deal or canceling Brexit altogether. She is “failing to deliver Brexit because she can’t build a consensus, is unable to compromise and unable to reunite the country,” he said. A recent YouGov poll found that 31 percent of the public preferred May as prime minister, 19 percent said Corbyn, and 46 percent were not sure. May has so far indicated that she is pressing on with the withdrawal deal she negotiated with E.U. leaders. She suggested on Wednesday that she could bring back her deal — dubbed MV3 — for a third time this week. On the other side of the English Channel, the Europeans wait and wait. Donald Tusk, president of the European Council, told legislators Wednesday in Brussels that the E.U. should be open to a long extension if Britain wanted to “rethink” its strategy. Tusk was referring to the “Cancel Brexit” petition hosted on Parliament’s website, alongside the mass demonstration staged Saturday in London — probably the biggest public demonstration in Britain in a century. As Parliament gets its indicative votes, May is still pressing lawmakers to support her Brexit deal in a third vote, which could take place later this week. Explaining the U-turn, he told the BBC that he changed his mind because the government has backed away from his preferred option, leaving without a deal, and May’s deal at least delivered Brexit. Things may be confusing on the Conservative benches, but they aren’t any clearer on the Labour ones. Speaking on BBC Radio 4, Labour lawmaker Peter Kyle spoke about his preferred Brexit option, that any deal passed should be put to a public vote. He said that during the “indicative” voting Wednesday evening, Corbyn “will order” the party’s lawmakers to vote for this. Labour lawmaker Barry Gardiner didn’t appear to get that memo. He told the same radio program that option was “not where our policy has been” and that “the Labour Party is not a remain party — we have accepted the result of the referendum.” His name was soon trending on social media. Like the Conservative Party, the Labour Party has been trying to walk a tightrope, appeasing both the “remainers” and “leavers” in their party. It did not go unnoticed at the massive on march Saturday — where an estimated 1 million took to the streets to demand a second referendum — that Labour sent its deputy leader to address the crowds but not its leader.